Fabric: Silk Faille Silhouette, Ivory. Beautiful A-line strapless gown with a curved/sweetheart neckline and asymmetrically ruched bodice with a dropped waist. 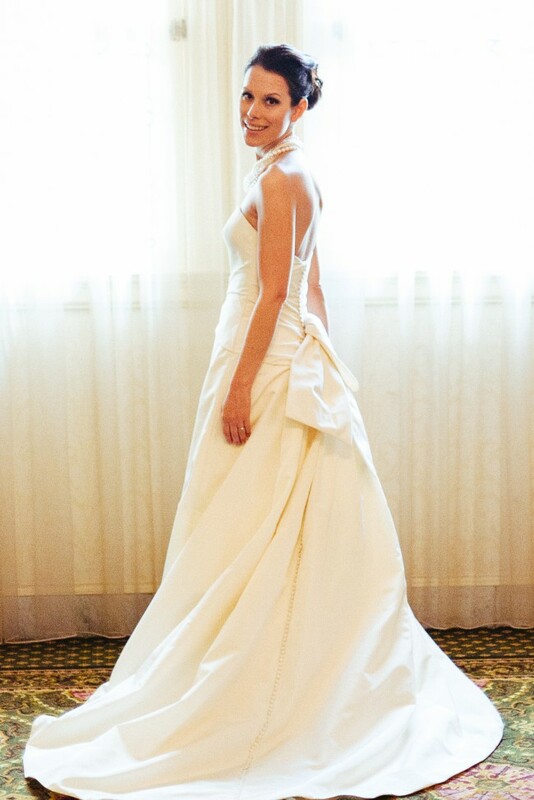 Small and elegant buttons and a lavish obi-inspired bow adorn the back of the gown. Chapel length train, with a discreet mechanism built-in to allow you to minimize the train when in-transit, if desired. Note: The dress was a size 10 when I bought it, but was way too big for me, so I got it altered to fit my regular size as I have a pretty small waist. It has been dry cleaned and stored in a clean, dry and odour free area since my wedding.